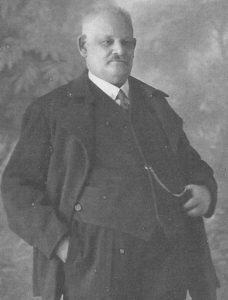 The following complete history was written by Axel Eichendorff and found in a web-site. 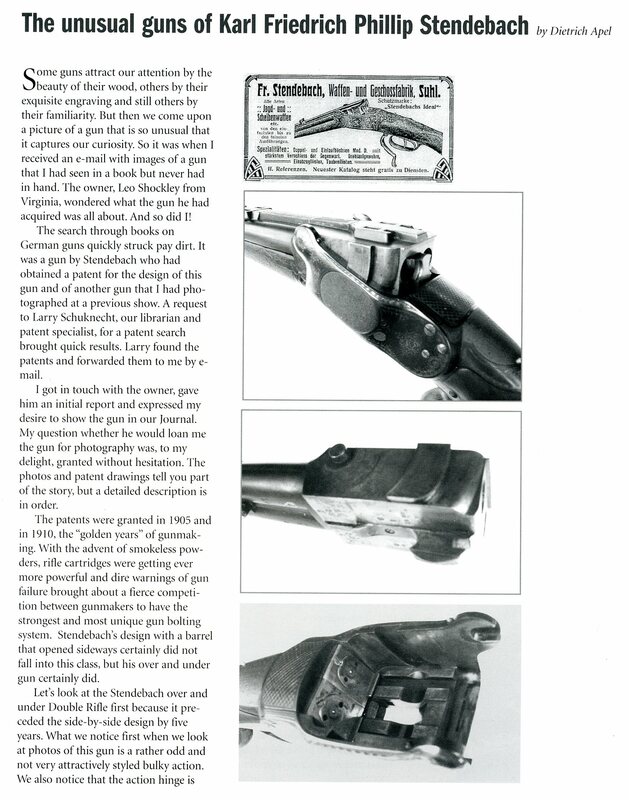 “Friedrich Stendebach’s last gun action patent, DRP # 229533 of 1907 had an “older predecessor” of this action. You have to go back to George Jeffries of Norwich British patent # 22 of 1862. Both the Jeffries’ and the Stendebach actions are effectively break-open actions turned sideways. On both actions the barrels are held to the breech face by the dovetail-shaped underlug going sideways into a corresponding cut in the action bar. In drawings this lug is curved on the Stendebach but wedge-shaped on the Jeffries.). 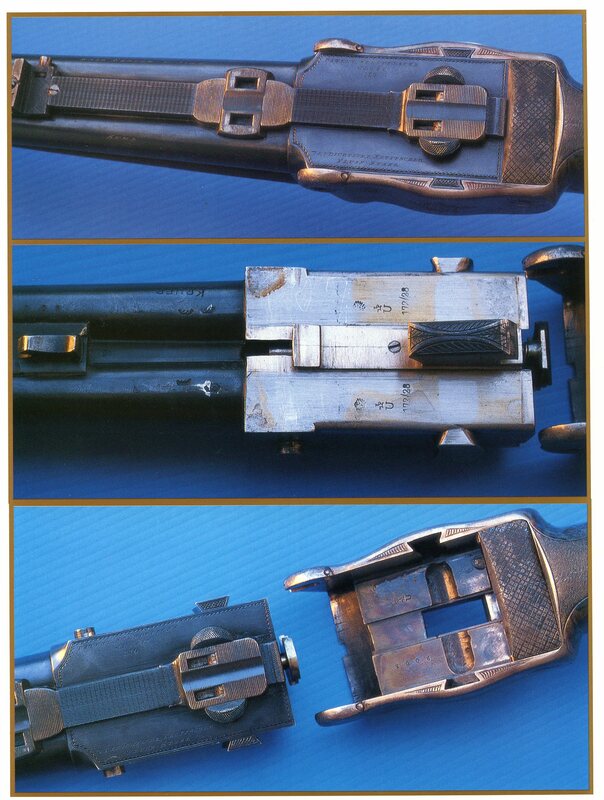 To allow the barrels to move away from the breech face both actions have their hinges set over to the left beyond the centerline of the left barrel. 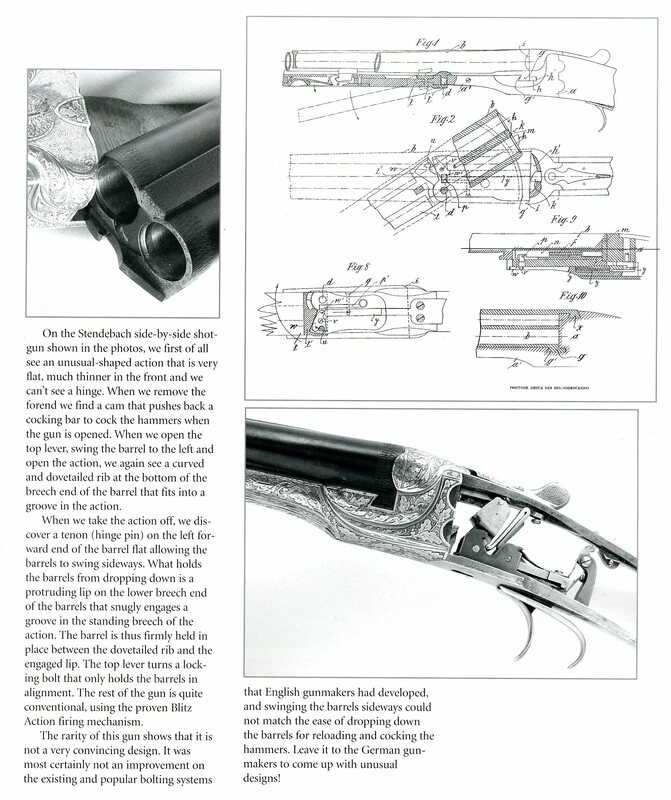 The purpose of both inventors was to get away from the up-down stresses that is used to “break open” a conventional gun. 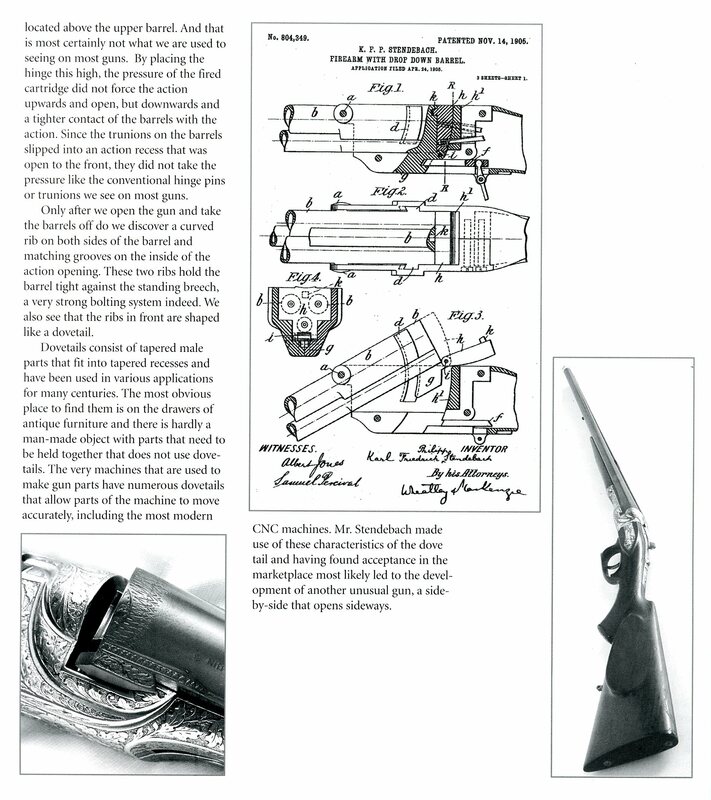 A Behr vs. Stendebach patent dispute was about another design, the Behr DRP 154950 of 1904 for killing cattle that showed some similarities to both Behr’s and Stendebach’s designs for unconventional break-open rifles. Apparently Friedrich Stendebach’s action designs, though very strong, were not very successful, reflected by the rarity of Stendebach patent guns and the confusing and muddled history of his many companies. Apparently Stendebach then teamed up with the former “maker” of Kersten guns under the name “Vierordt, Stendebach & Cie. GmbH” with branches in Frankfurt a/Main, Säckingen, Gmünden a/Main., Suhl and finally Augsburg. To add to the confusion, there was in the 1920s the STENDA-Werke GmbH, Amtmannsweg 37 in Suhl, owned by Max Stendebach,. Stendebach’s most successful invention, in fact the only one still remembered, was his Stendebach Ideal shotgun slug. 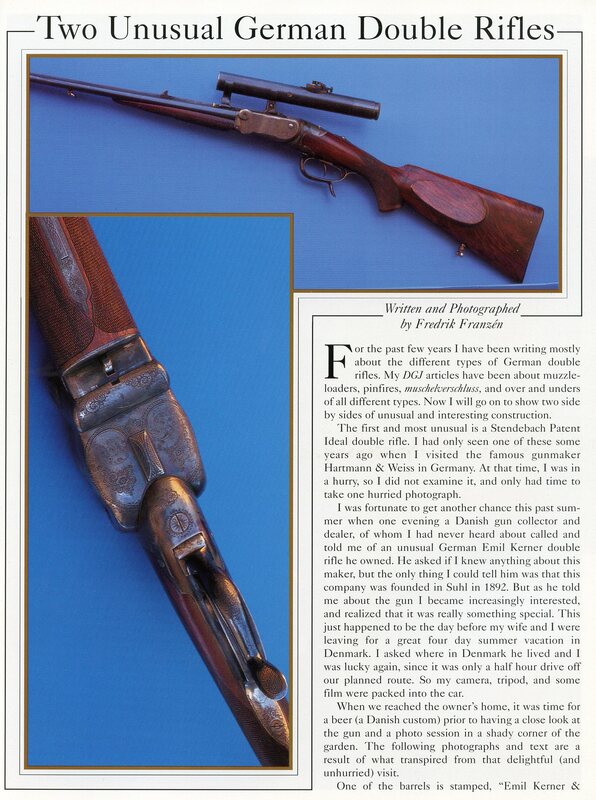 At the bottom of this page you will find a link to a pdf with pages of a Stendebach catalog that shows mostly his ammunition and patent drawings of his two gun inventions. Click Here to view a Friedrich Stendebach catalog from circa 1912. The following article appeared in the Winter 2001 issue (Vol. 12, Iss.4) of the Double Gun Journal and is courtesy of Fredrik Franzén, the author and Daniel and Joanna Côté, the editors of the Journal. A back issue with the full article is available by calling (800) 447-1658.